architecture in uruguay surveys the contemporary condition of the country’s built environment, showcasing a range of innovative projects and the diverse materials and unconventional forms employed in their construction. 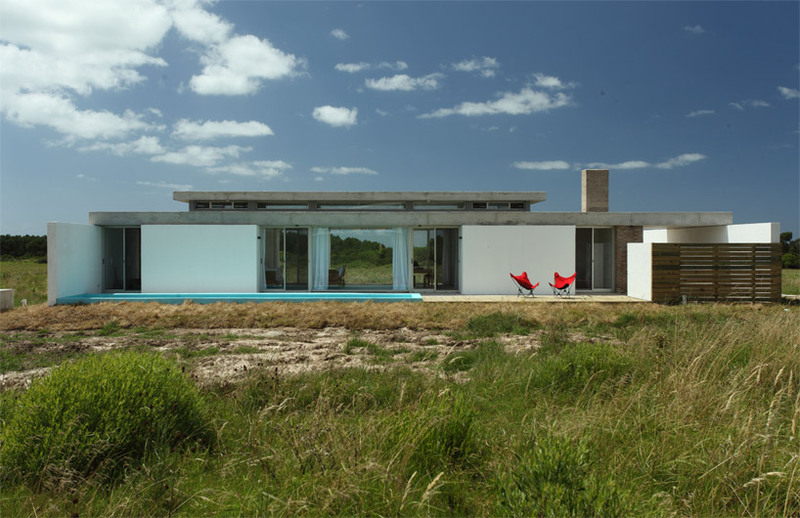 buenos aires-based practice lacroze miguens prati have completed ‘la compartida’ a residence positioned within a field in tajamares de la pedrera, rocha, uruguay. a minimal rectilinear volume stretches along a northeast to southwest axis. a low-profile roof spans the continuous interior, with a stepped profile to introduce natural daylight through a clerestory band. glass walls enclose a central living space, offering views to the meadow in either direction. the quaint size of the common areas is expanded by visual transparency to the rolling landscape. the interior opens to a veranda which borders each side of the building, one containing a swimming pool which parallels the facade. the end wing contains the master bedroom while the opposing half of the home is subdivided to create two intimate spaces, large enough for individual sleeping quarters. 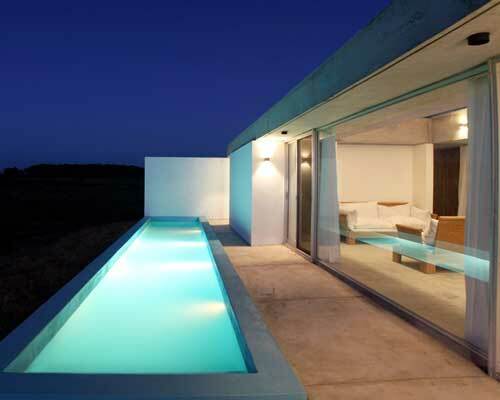 architects: LMP architects location: tajamares de la pedrera, rocha, uruguay. 34º s – 54º w.
no i dont like it. If i was to look for a creative home to live in, i wouldnt even consider this for a second. how does this feels homely,cozy or even a sense of feeling of being home? what makes this worthy of being bought or even a place to live? It looks like a mix of retro home in a rectangular transportation bin and 70’s office space. where is the kitchen? and the swimming pool… really? it doesnt even have protection from wild animals like coyotes if you’re gonna go swimming at night. Fria y fea. La terminacion de los muros exteriores dan la sensacion de que los terminaron asi nomas por no pensar, de haber usado piedra , madera o cualquier otra cosa hubiese sido mejor. La piscina tiene unos muros pegados que hacen que parezca que estas en un patio en vez de darte la sensacion de estar donde realmente estas, mas alla que sirvan para parar el viento etc. La verdad que no me gusto nada! @Hans, there is a Mc Donalds nearby I think.. and a minefield in front of the pool for the coyotes..
LOL, No coyotes in the area, go study some geography! Agree with the squeezed dining table , even worse, the “kitchen corridor”, I would rather have it in the living area with a bar/table. taste is a personal thing and i actually like this. when you\’re indoors, all you see from either side is the landscape. instead of feeling cramped i think it would open up the space and make me feel very liberated.